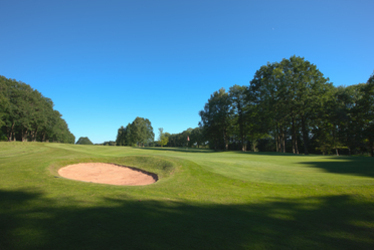 A relatively short par five hole with a slight right to left dog-leg that looks as though it offers up the chance of birdie. A reasonably good tee shot in the fairway makes the green reachable in two in the summer months. But be careful, all the protection for the hole is in the front to back sloping green, and getting the ball to stop can be frustratingly difficult. With a fairway that slopes right to left and a long, narrow green, an inaccurate approach left or right of the green will leave a tricky chip to the green.